Over the weekend, popular Afrobeat singer, Femi Kuti caused a scene that attracted a large crowd when he sought help to fish out a lizard that entered his car via the dashboard on the Third Mainland Bridge in Lagos. 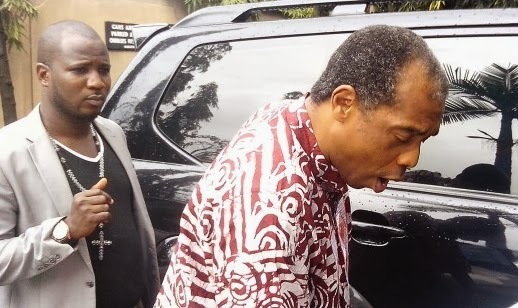 Femi Kuti narrated his ordeal jokingly at MUSON Center’s pre-event news briefing. The Afrobeat King said he was horrified by the event. He said a lizard appeared all of a sudden, from the dashboard of the car, while he was at top speed, starring at him snappily before ducking away. In no time, the search party increased around the Black Prado Jeep. Perhaps then, it dawned on the musician, how seriously he had painted the scenario. The crowd, including his colleague, Yinka Davies begun to get amused, and Kuti, tried to make a joke of the situation. “You know, it could have been a disaster if the lizard had run through my trousers, climbing to my private part. You can imagine how jumpy I could have reacted, trying to protect my manhood. Because, that to me is an important part of who I am, I can’t joke with it.” The crowd roared with laughter. “Evil people could be at work,” added the musician jocularly, still wondering how the lizard got into his car. After the event, Femi Kuti refused to drive the car until the lizard was found. Hahahaha so this bobo too fear winch winch people…. funny man!